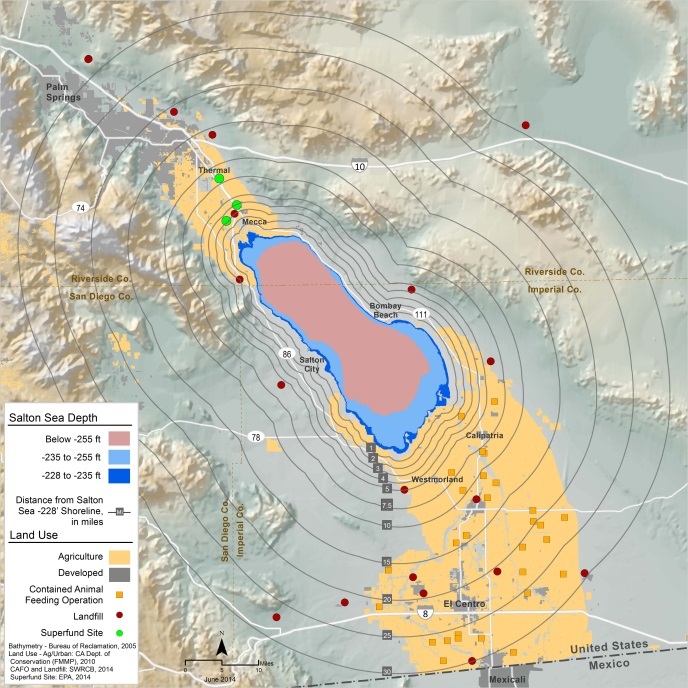 The declining Salton Sea will impose massive public health and environmental costs on local residents and Californians generally, as described in the Pacific Institute report Hazard’s Toll. The continued failure to protect and preserve the Salton Sea, worsening air quality and the loss of valuable ecological habitat – combined with diminished recreational revenue and property devaluation – could cost as much as $70 billion over the next 30 years. The high costs of California’s 2007 plan for the Salton Sea have inhibited deliberation and deterred any meaningful investment in revitalizing the Salton Sea. Many decision-makers assume that delaying action at the Salton Sea will result in business as usual, with no additional costs. Hazard’s Toll makes clear that this is not the case. Because the Salton Sea has changed over the past decade and will soon enter a period of very rapid decline, the costs of inaction are escalating rapidly. Even at the low end of the costs estimated in Hazard’s Toll, the long-term social and economic costs of a deteriorating Salton Sea could approach $29 billion, well in excess of the project cost of the state’s plan. The consequences of continued inaction at the Salton Sea will be felt most directly by the 650,000 people who live in harm’s way of the Salton Sea’s dust, as well as by the birds and other life that depend on the lake. 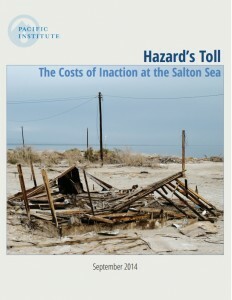 Hazard’s Toll estimates the costs of these consequences, for the first time. These considerable costs demonstrate the urgent need for action at the Salton Sea. 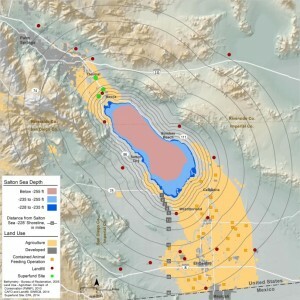 The Salton Sea in context. The report also highlights a large number of important data gaps that should be addressed in the near future. Despite many decades of study and the impending decline of the Salton Sea, we still lack information on many factors affecting life and the economy in the region. These factors, combined with general uncertainty about population growth rates, climate change, and changing hydrologic conditions, suggest that the above estimates indicate a general magnitude of potential future costs, rather than precise projections. 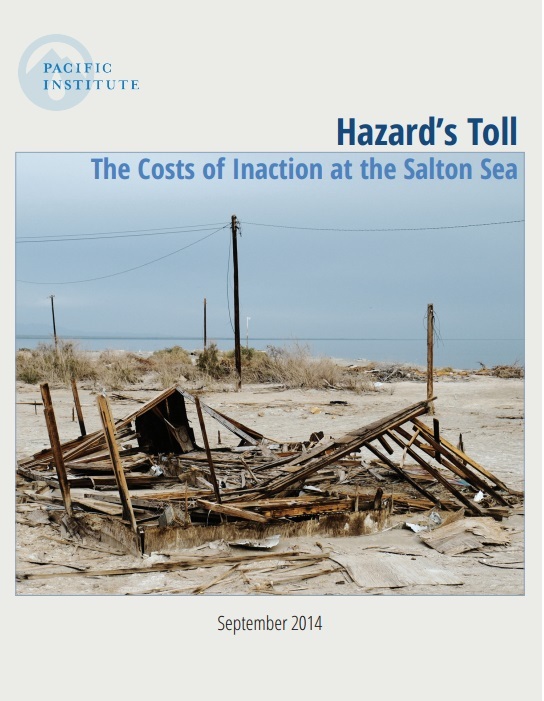 Hazard’s Toll is a companion volume to Hazard: The Future of the Salton Sea With No Restoration Project. The 2006 volume contains information on the formation, ecological processes, and hydrology of the Salton Sea, as well as an assessment of the potential ecological impacts of the Sea’s current decline. (9/15) Read the latest National Geographic blog, New Hope for the Salton Sea.